Birthdays are great, aren’t they? You’re another year young, or one more closer to dieing; I suppose that depends on your viewpoint of life. Personally, I think that birthdays are a great way to celebrate another year of personal growth, happy memories, and healthy days. I love birthdays, and if today is your birthday, then ‘Happy Birthday!’ You share this day with the father of genetics, Gregor Mendel, guitar legend Carlos Santana, super model Gisele Bündchen, pitchman Billy Mays, and Everest conqueror Sir Edmund Hillary. You’re in good company! Unfortunately, today was also Dave’s birthday. The sign reads "Happy Birthday Dave!" 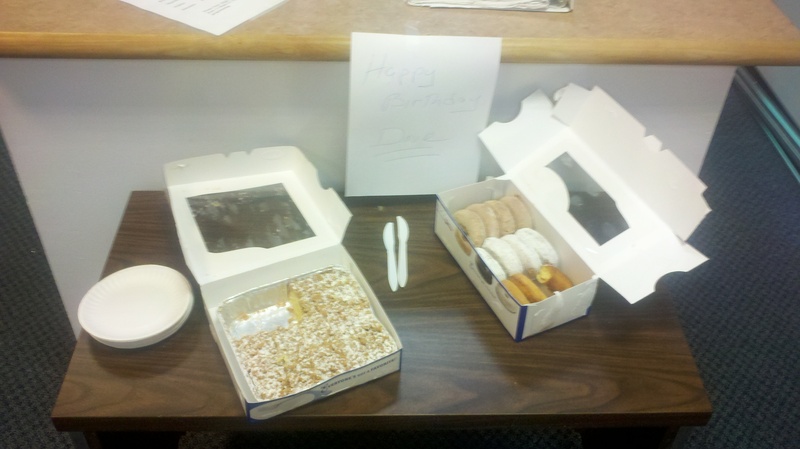 Now birthdays need celebrating, but we don’t need crumb cake and donuts in the fitness center! This is almost as bad as Planet Fitness hosting monthly Pizza Parties. Today, I watched another trainers client eat two donuts during a ‘bathroom break’ in the middle of his training session; I hope he doesn’t question the sub-par results he’s getting. (As a sidenote, I watched a trainer argue with her client about drinking Diet Coke during her training session last week.) Sure, a lonely doughnut might not be that detrimental to your health, but I think it’s negative to both the members of the gym as well as the gym itself. Why do people exercise? They want to be healthier, feel better, look better, or perform better. Poor nutrition is going to limit your results for any of those goals. Poor dietary decisions are a huge issue in a country where a dollar gets your a burger at fast food joints on every street, and where we opt for bagels and Pop Tarts because cooking eggs takes a few minutes and healthy yogurt isn’t sweet enough. People who regularly exercise at a gym are a miniscule minority in our population, and reinforcing their ‘good’ behavior is extremely important. Even if they’re regularly exercising, some people only do so out of obligation or pressure; from family, a doctor, or the stretch in their waistband. Weight loss is the most common reason for exercise in our country, so it’s safe to say that most people want to lose weight. Why are we giving these people donuts? It’s unprofessional for an organization that cares about the health and wellness of their members to provide foods that are considered unhealthy according to every public health and public organization. Not only are members provided with the very food they’re likely striving to stay away from, but it reinforces the idea that any ‘special’ event is a green light to eat whatever kind of crap you want! That’s not the case. Don’t get me wrong, I like to eat food. I don’t think you’ll ever find me passing up Ben & Jerry’s Phish Food, and I could make a Chinese Buffet rethink their all-you-can-eat policy. Just don’t do it all the time. If you have a cheat meal here or there during the week, or you spend a few hours eating twice what you normally would, it’s not much of an issue. The issue arises when you have a snack for Dave’s birthday, then you celebrate Hemingway’s tomorrow and Raymond Chandler’s on Saturday. When your one casual snack turns into a twice daily habit, you’re going to have some issues. 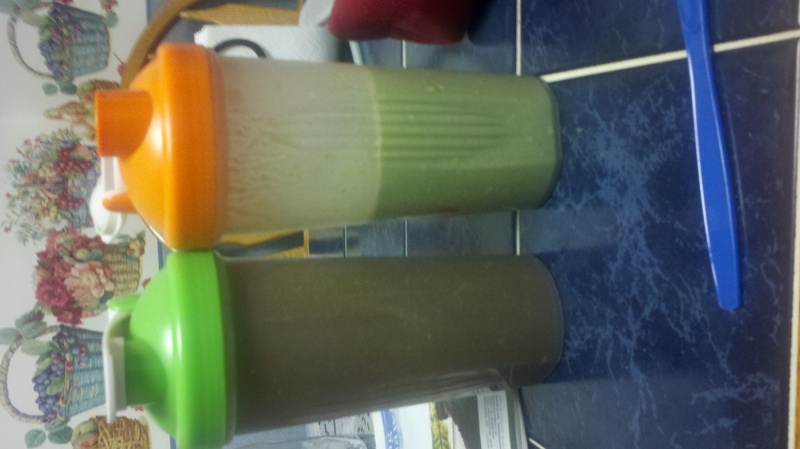 V8/Protein/Greens on the left, Spinach/ Strawberry & Banana on the right. If you’re rewarding your body with exercise, you should also reward it with proper nutrition…most of the time. If your diet is ‘clean’ and you’re eating a vast majority (90%) of plants and animals, then you can get away with some naughty nutrition on occasion. If you’re celebrating a birthday, anniversary, or major holiday, plan for any extra eating that you’ll be doing, and make sure that you’re not sneaking sweets in the days before and after that holiday. You’ll feel better, and you’ll end up seeing better results from your exercise and eating habits. Just do me a favor; don’t forget to live a little. If you have the chance to try some new foods, go ahead and expand your palate. Just please don’t do it at the gym, and be thankful that Dave’s birthday is now a year away. Next PostNext Get After It, Grandma!